In this day and age, “true-to-life” movies have become the domain of the Channel Five afternoon line up. You know, the ones where you’ve not bothered with going into work, so you’ve feasted yourself on the several, low-budget, American, “made for TV”, oestrogen filled dramas of babies with several mothers, and the like. 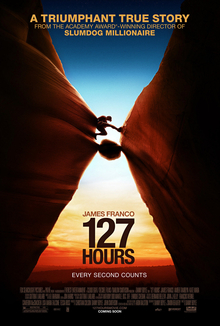 127 Hours, however, may just alter the perception, target audience, and connotations of the “based on real life” genre. Picture it now: you’re a thrillseeker. A daredevil. You’re independent. Not only have you joined the national rescue service [just to get that extra adrenaline rush], but you mountain bike, hike, and scale mountains just to pass time. But suddenly it goes horribly wrong. One minute, you’re reciting song lyrics by Phish, then, out of nowhere, it feels like fate has suddenly plucked your number out of the hat. You’re trapped in the middle of a canyon; a dense, gargantuan boulder pinning down your right arm so you’ve got no choice but to make some giant sacrifices to survive. Welcome to the life of Aron Ralston. 127 Hours [Which, thankfully, is actually only 97 minutes], shows Ralston’s [James Franco] dilemma. Montages from his childhood, hopes for his future, and regrets from the past all combine to impact on the dilemma of his situation. The only things he can see are the dense mounds of rock that surround him, the only thing he can hear is the caw of the ravens that circle above his head, and the only thing he can feel are the glossy-bodied, multi-legged insects that crawl and squirm their way around his body. There’s no-one that he can call for help, he doesn’t have a mobile phone, and no-one knows where he is. So while his hand is being crushed to the point of being blue by a giant rock, all he can do is record a video diary, and pray that, if he dies, someone will find it, and alert one of his relatives. Franco puts in a sterling performance, capturing every moment and emotion of Ralston perfectly; his acting topped off and complimented amazingly by several montages placed in by the directors, which may seem strange at first, but make perfect sense when examined psychologically. But how far would you go? Some of you would probably just give up after calling for help. Others would probably just pray for a miracle. Aron Ralston, however, [and remember: this is a true story], went that extra mile. In the most shocking piece of cinema for quite a while, after several days of being stuck, James Franco re-enacts what Ralston had to do in 2003: self amputate in order to get out alive. I’ll state it now: this scene is not for the weak stomached, or those with a bit of a dodgy ticker [though, those of you with an interest in medicine and anatomy may not be so badly affected- my girlfriend seemed to even stop blinking throughout the montage]. The scene, which, I believe, was relentlessly worked on by medical professionals for the purposes of accuracy, isn’t your bog-standard amputation scene. Not only is Ralston’s arm pinned down, but you hear the sounds of his bone snapping; you feel the piercing pain of cutting through the nerve. But why does he do this? …You’ll have to see to find out! In summary, this is a fantastic movie. If you don’t want to go for the ‘real-life’ factor, you most certainly go for the emotional tension throughout the movie, and the audience tension within the amputation scene. Brilliant cinematography by Danny Boyle, and an outstanding [almost-]one man show by James Franco.